Look at them. Don't they make you cringe? At a glance, you can just tell they snag and pull, those 'no-slip' ones rip bunches of hairs out every time I use them, my eyes are watering just thinking about it. There's a silicone one under there that also takes a handful with it whenever it's near my scalp and we're not even going to start in on those flat ones with the flowers... And how about these colours - what am I, a preschooler? 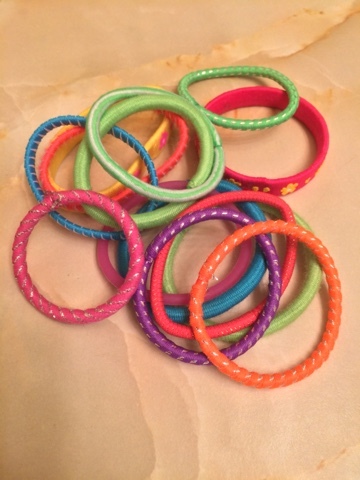 But before you throw out all of your crappy hair ties and tear-jerking elastics, let me share with you a beauty hack that will have you scrounging in your drawer of hair accessories in search of your spurned scrunchies. In addition to a pile of ugly painful hair ties, there is the ongoing issue of where to dry freshly cleaned makeup brushes. I don't know how it is where you live, but for me, laying all my brushes out to dry on a bathroom counter takes up valuable real estate that I don't have. I don't want my brushes to sit damp on their sides on a towel, etc. I also can't stand the idea of my clean brushes being within splashing distance in a shared space. Ideally, brushes should be lightly towel-dried, hand-shaped and hung to dry for optimal longevity. Don't be rough with a wet brush since bristles are more fragile when damp and the adhesive that secures the ferrule to the handle can be compromised when moist. This is why I never soak my brushes in water when cleaning either. I try to treat my brushes the same way I would treat my own hair, and I think of brush cleaning as giving each one a shower, never a bath. This ensures that makeup tools work to their potential and that brush heads stay well-glued to their handles over time. 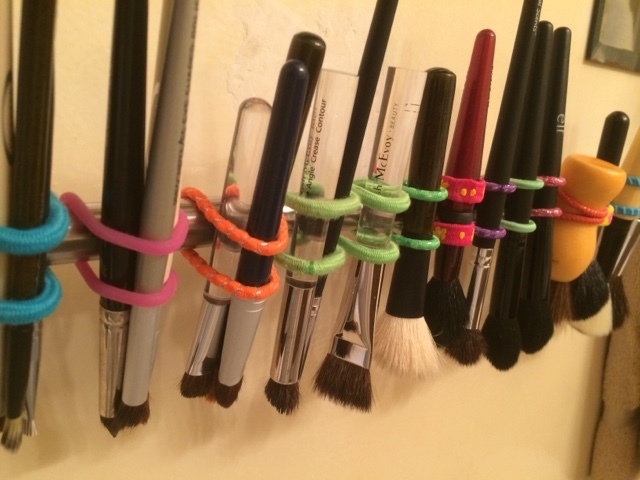 So... how can you hang your brushes to dry and finally put those hair elastics to good use? Secure hair ties around your upside-down brushes, double-looping them onto a bar or towel rack for cleaner, faster brush-drying and now your counter or tabletops are clear as well. I have been using this method for more than a year now and my brushes have never been better. Makeup brushes are often some of the biggest beauty investments we make and I believe there is truth in the notion that good quality brushes can make even mediocre makeup look great. Take care of your brushes with some of the same attention that you pay to your own hair (cleansing, conditioning, etc) and your tools will perform optimally, be hygienic and last much longer. Whenever I'm at Asian dollar stores and drugstores, I seek out empty dispensing bottles of every kind, perfect for creams, liquids, and soaps, etc. They are hygienic, thrifty, and extend the shelf life of products since they limit exposure to air and moisture. I use mine for face primers, tinted moisturizers/foundations and cleansers that I love but for the packaging. This also means that I can now clearly see how much product I have left, and if there is any deterioration as the product ages, added bonuses for these types of products. I fervently enjoy slathering high-quality skincare oils on my face, body, hair and nails. While shopping, I look for small spray, roller and dropper-topped bottles that I fill with some of my best-loved oil blends which are then a joy to apply. My list of favourite oils includes: camellia, seabuckthorn seed and fruit, rosehip, evening primrose, calendula, castor, hempseed, apricot kernel, almond and coconut oils, listed vaguely in order of ardour (with unfortunately corresponding prices). Natural groceries, health food stores and soap-making vendors sometimes sell lovely glass apothecary jars and bottles, best-suited for oils and gels since they do not readily react with ingredients. My favourite vendor for natural beauty ingredients is Cranberry Lane, where staff are usually able to answer my questions about packaging and preservation. I fill small fine mist spray bottles with my favourite hydrosols - rose and lavender, which I place strategically (at my workstation, in my purse, at my vanity, etc) so I can mist my face and hair anytime for a quick pick-me-up. These multipurpose sprays prep my skin for moisturizer, set makeup once it's applied, refresh skin and hair, and I love to use my rose or lavender waters to dampen makeup sponges and brushes for use. I don't blend my floral waters since I like each for a different reason, at different times of the day. Aside from smelling great, these liquids are sterile, shelf-stable, alcohol/glycerine/additive-free and deliver added benefits from their floral ingredients. I buy mine from Cranberry Lane or from reputable candle/soap-making vendors. Decent health food stores often sell high-quality rosewater and other floral essence waters for you to try. My local Asian dollar store is where I picked up this adorable "Pack tool set" for just a few bucks. It contains a trio of measuring spoons to dole out your ingredients, a sturdy bowl to mix up your mask paste with a matching spatula, plus a flat-tipped brush to apply it to your face. Combined with one of the face mask paper sheets which are moistened and placed on top your concoction so it all sinks well into your skin (which you can buy here in multipacks for just a few dollars more), you can make yourself a fresh custom face mask that rivals anything you can buy. A large clean soft powder brush (instead of your fingertips) is best to gently pull the lower lashline down when applying eyeliner or messy glittery eye products. It won't disturb the makeup you've just applied, and catches any falling shadow so the sparkle stays only where you want it. A big fluffy brush is much better at keeping everything tidy during those final steps when you don't want any smears or fallout wrecking your handiwork, while being cleaner and kinder to your face. Microfiber towels with gentle textures are a potent and practical way to wipe away makeup with no scrubbing or damage. They help remove every little bit of glitter from face and hands, and are great to fix mistakes during application, you don't even need makeup remover, just lightly dampen a corner with warm water and gently touch-up your boo-boo. At a fraction of the price of fancy makeup remover cloths, they are a true beauty bargain. You can also cut your own facecloth-sized squares from a hair or bath-sized microfiber towel, which can be found routinely on sale in many places, often in the fitness and bathroom accessories aisle. 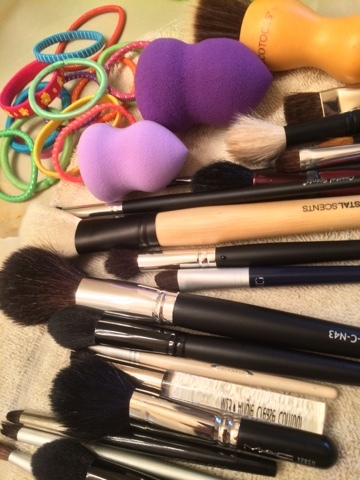 They also remove makeup and any lingering oils very effectively from your equipment and workstation. My local Asian dollar store has a good selection of microfiber rags (sometimes found in the household cleaning section), in several different textures and sizes but I go for the fluffiest, softest-looking ones in bright colours for makeup use. Although generally gentler to skin than traditional cotton facecloths, microfiber fabrics are so efficient that they absorb most of the surface oils and humectants that keep skin moist; please remember to moisturize after use. Sleep on a soft silk pillowcase to keep your skin and hair in top condition. At very least, try natural bamboo cases which are less absorbent and abrasive than cotton or microfiber (both dry skin out by absorbing moisture and products), and stay away from of scratchy poly-blends. It's counter-intuitive to spend your waking time, money and effort maintaining your skin only to mash your face and neck against fabrics that are coarse or rob your skin of moisture during its nightly renewal process. Don't toss clear nail polishes that are a bit too thick and gloopy to serve their original purpose. It's a fine time to try mixing it with old shadows or glitters that you don't use; add a drop or two of non-acetone polish remover to thin out your polish enough to give it a second life. Clear nail polish is so handy around the house and garden too! It can stop a run in your hosiery or keep a loose button in place until you can repair it, with endless clever uses, just keep it away from your face and don't eat it! Seriously, I've read 'hacks' that suggest using clear nail polish to block off some of the exit holes in your salt shaker to throttle how much pours out, but I think it's a bad idea to risk ingesting nail polish, since I don't trust it to be dishwasher-safe over time. Use your imagination and good judgement, as ever.